I’m old enough to remember seeing the MGM Technicolor film masterpiece, “Seven Brides for Seven Brothers,” in a real theater on the wide screen. That was the kind of joyful event the memory of which the intervening years cannot diminish. Now, for those lucky enough to get one of the remaining tickets, that delicious musical is available live on the stage of the Crighton Theatre for a very limited time only. If you have been blessed to come across this report in time, be blessed again by going to see the show. You won’t be sorry. Oh, and by the way, if you have youngsters old enough to sit still at a great show for two hours, by all means bring them along. Failing to do so might result in your being charged with child abuse. Those fortunate enough to attend will see a cast of fellow youngsters so full of talent and enthusiasm, it may cause them, for a time, to forget all about the usual distractions of video games, cell phones and mediocre television fare. At the same time your kids will be learning about the real joys the theatre can afford them. 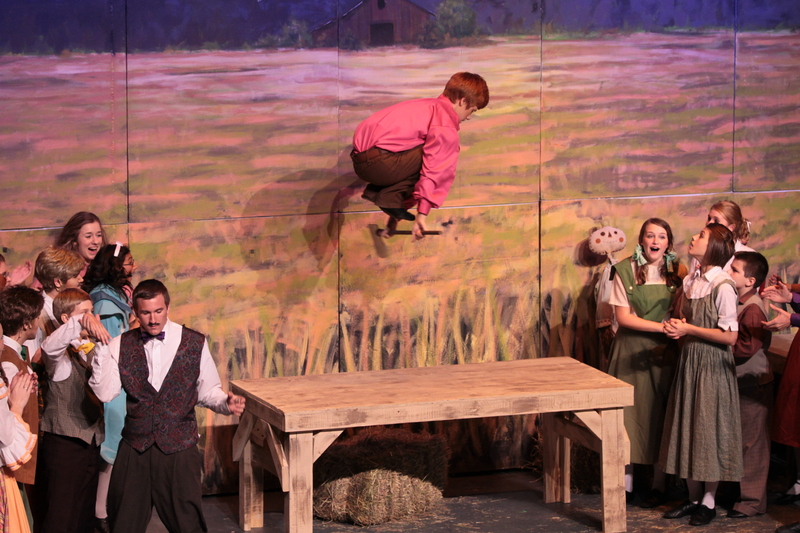 A marvelous group known as Christian Youth Theatre brings us the theatrical magic I am describing. For those who might fear this is some proselytizing church group with an agenda, put those fears to rest. There is none of that here, though during a pre-show tour backstage I learned that the spiritual connection that binds this fine cast was refreshingly present in a private, “pre-curtain” prayer session among the players that was not unlike the locker room prayer for a sports team before the big game. But once that curtain went up it was just a delightful stage musical all the way, not unlike the wonderful Tom Sawyerproduction the group offered at Crighton last fall. Milly teaches the boys to dance. For those unfamiliar with the story, it revolves about seven brothers who live in the mountain backwoods and their quest to find brides from the nearby town. Based on the aforementioned 1954 film directed by Stanley Donen, (with music by Saul Chaplin and Gene de Paul, and lyrics by Johnny Mercer), this MTI edition has a book by Lawrence Kasha & David Landay, some new songs by Al Kasha & Joel Hirschhorn, and is skillfully directed here by Ray Pereira with terrific show coordination by Wendy Brasher. Anchoring this fine production are the extraordinary talents of fourteen year-old Austin Hartis (in the role of the oldest brother, Adam), and seventeen year-old Kaylin Hill (in the role of his bride, Milly). Milly (center) with the brides-to-be. There is solid support from Kelsey Kalberer, Christine Plunk, Courtney Kalberer, Kelcie Glaspie, Kaitlyn Glaspie and Rachel Willis as the remaining brides, while Zane Nixon, Cameron Lichnovsky, Jordan Sacchieri, Christopher Jurek, Timothy Jurek and Joey Sheaff delightfully portray Adam’s brothers. Understudies, Mary Robbins (in the lead as Milly), Christina Seberino, Cassidy Lichnovsky, and Abby Bailey will be featured in tonight’s performance. 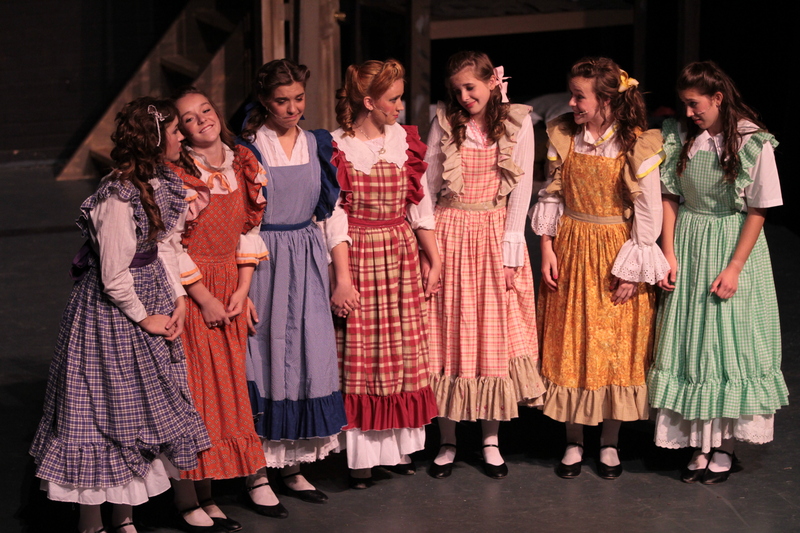 A wonderful singing ensemble of Suitors and Townspeople rounds out the fine cast. Nicholas Flores plays the Preacher who is ultimately confronted with officiating at probably the largest, sweetest and most innocent “shotgun wedding” on record. 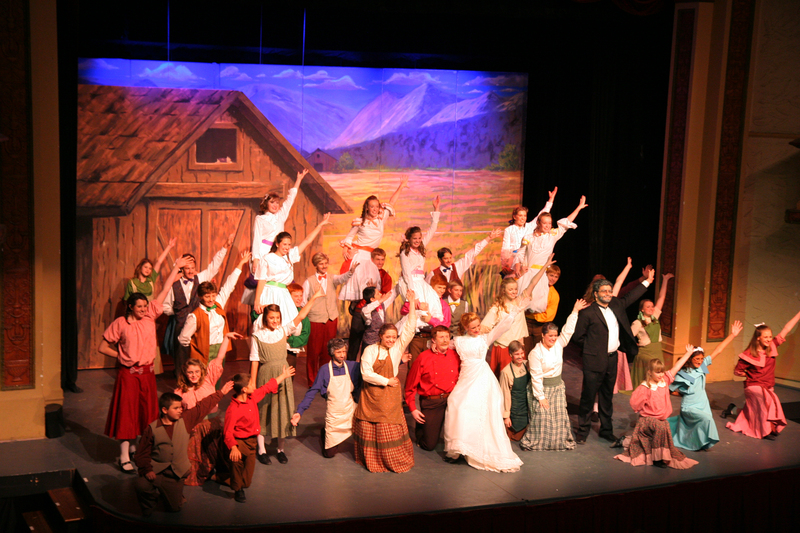 Several key elements contribute to the success of this production. At the performance I attended the very lovely Miss Hill was enchanting as Milly and she had a gentle sweet voice to match. More than once she reminded me of Jane Powell in the original film. What was perhaps even more remarkable was the lusty and convincing portrayal of Adam by fourteen year-old Mr. Hartis. Tall, handsome and husky, with a resounding voice and commanding stage presence for songs like “Bless Your Beautiful Hide, he could easily have passed for twice his own age while often reminding one of Miss Powell’s film co-star, Howard Keel. 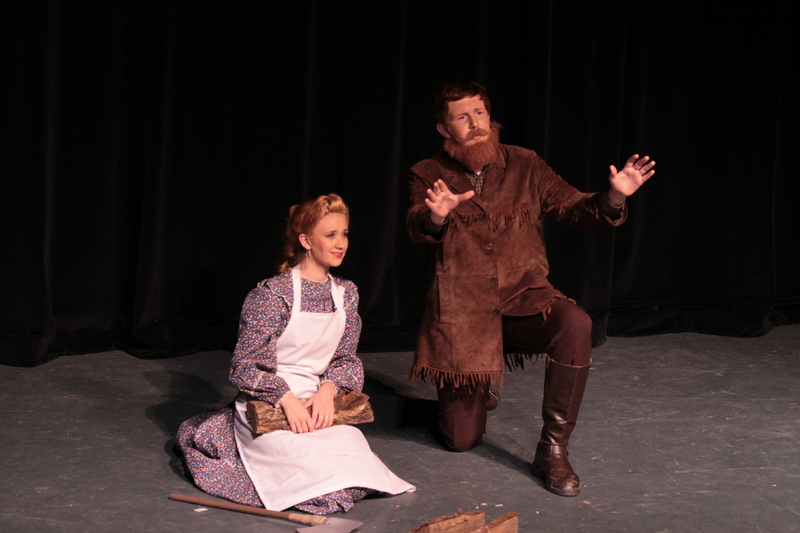 The pairing of Hill and Hartis is clearly one of the anchors of this production. Another is the extraordinary dancing of the full cast under the brilliant direction of choreographer, Kim Glaspie, with assistance from Tiffany Plunk. What a tribute Glaspie has constructed to the original choreography of Hollywood’s legendary Michael Kidd. Perhaps it will sound as though I am exaggerating, but there were high kicking and acrobatic dance sequences in this production that seemed more extensive and elaborate than the brilliant ones I have enjoyed so many times in the film. That a cast of nearly fifty youngsters with an average age of thirteen accomplished all this makes the results all the more remarkable. 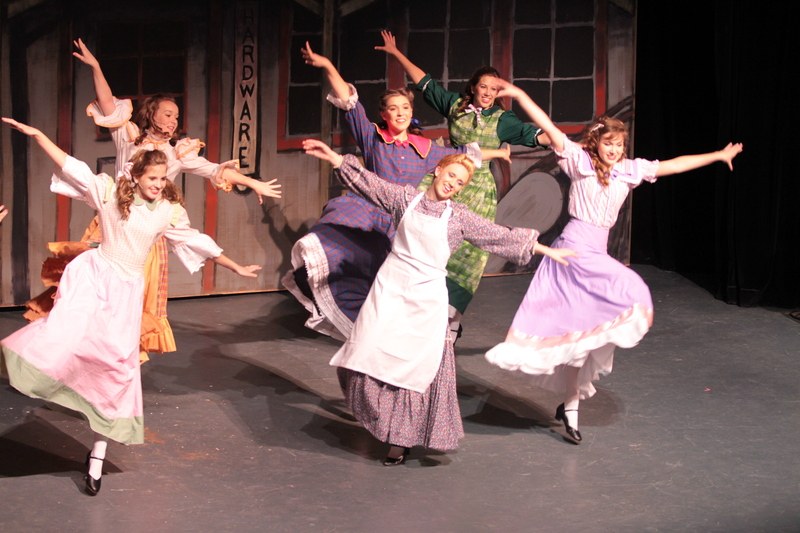 Adding to the glow are the richly colored costumes of designer, Marci Lane and her army of parent volunteers, along with the charming farm country set designs of Rob Holbrook & Brandon Nixon. And if you don’t believe this is farm country, just keep your eyes peeled for real farm animals that include a piglet, a goat and a chicken. All performed superbly. Yet another element of this major success is the often-lovely music and the singing of the large cast. (Music Director, Mandy Henson & Asst. Vocal Director, Christy Hill). I say “often-lovely” advisedly because there were times when the soundtrack musical score was simply at too high a volume to properly show off the fine young voices of the cast. Fortunately there was only one notable failure of the notorious body microphones currently so popular. There were several songs original to this updated production, and in a few cases, like the early selections of Act Two, I think cutting a weak number here and there would have enhanced the overall impact of the stronger and more familiar melodies. And speaking of impact, watch for a very convincing snowstorm and avalanche, all nicely wrapped in the lighting of designer, John Romain, and the sound designs of Rick Hill. There were countless other highlights. 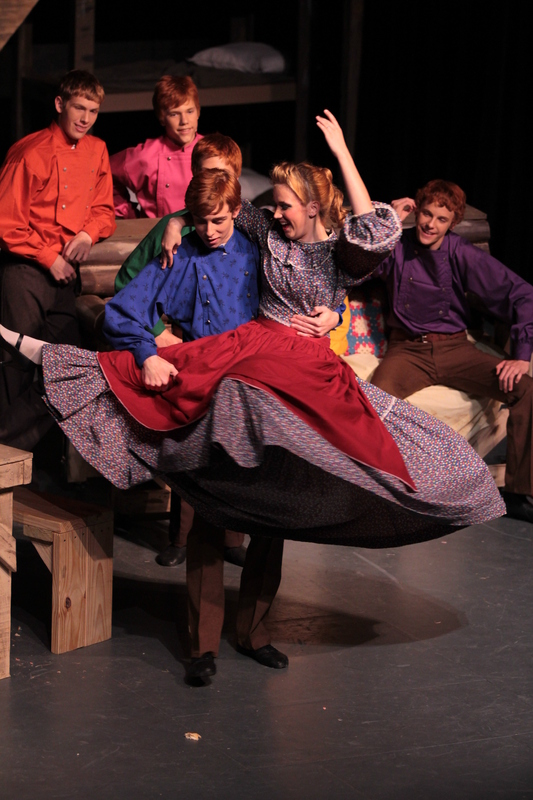 The breezy sweetness and gay dancing of the “Wonderful, Wonderful Day,” and “Goin’Courtin’” numbers was memorable. With Milly’s etiquette guidance and a witty script, the transformation of these rowdy, ill-mannered backwoods brothers into respectable young gentlemen is great fun to watch. (Adam is less easily convinced as he snaps, “What do I need manners for? I already got me a wife!”) The brides and brothers are perfectly cast and bring charm to scene after scene. Miss Kalberer as Alice and Mr. Nixon as Gideon make a particularly sweet young couple, with Nixon reminding one a bit of Ron Howard when he played innocent young Opie on The Andy Griffith Show. And of course that shotgun wedding scene I mentioned makes for a dazzling finale that will send you home smiling. 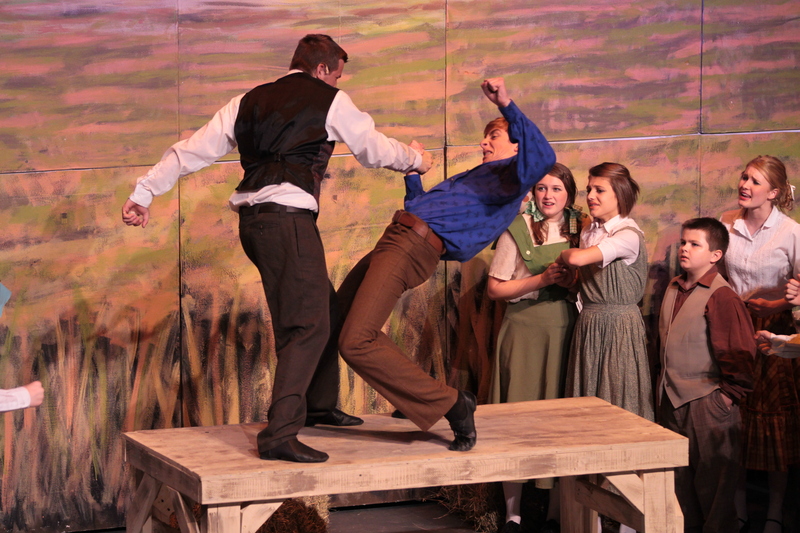 SEVEN BRIDES FOR SEVEN BROTHERS continues at the elegant Crighton Theatre, 234 Main St. in Conroe. 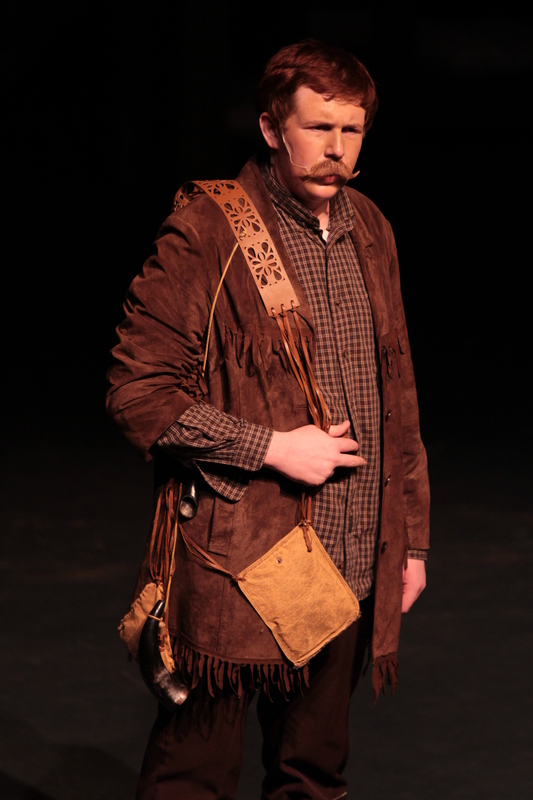 Performances are at 7 pm tonight and tomorrow, with 2 pm matinees this weekend on both Saturday and Sunday. For tickets & information call 936-441-7469 or visit the websites, www.crighton-theatre.com or www.cythouston.org. This entry was posted in Broadway, BroadwayStars.com, The Courier Columns, Theater Reviews, ThePeoplesCritic.com and tagged Broadway, Crighton Theatre, musicals, plays, Reviews. Bookmark the permalink.